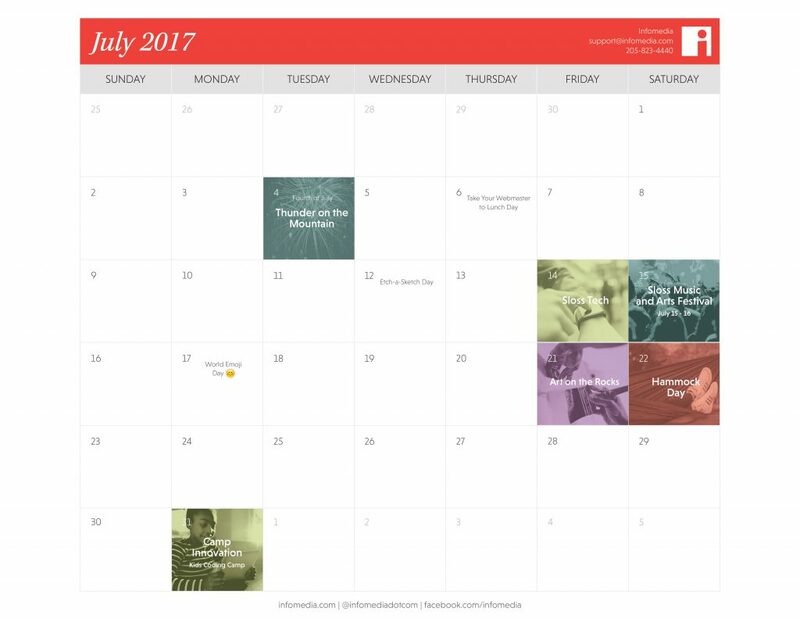 Our Free July 2017 Birmingham Calendar Is Here! | Infomedia, Inc.
Our Free July 2017 Birmingham Calendar Is Here! Our free Birmingham, AL events calendar for July 2017 includes what to do in the Magic City this summer including SlossTech. July is almost here, and along with the fireworks and beach vacations on our calendar, this month is all about tech in the Magic City. It all starts July 14 with SlossTech, and wraps up at the end of the month with Camp Innovation, a coding camp for kids. We’ve included some silly holidays on our calendar, too, of course. What’ll you be creating on Etch-A-Sketch Day? And might we suggest an observation of Take Your Web Master to Dinner Day? If you’re looking for a date, we have a few candidates right here. We hope you enjoy your July in Birmingham and that our calendar helps you come up with some fun ideas for blogs and social media posts to run this month. For daily updates of what’s going on at Infomedia and in tech, follow Infomedia on Twitter.